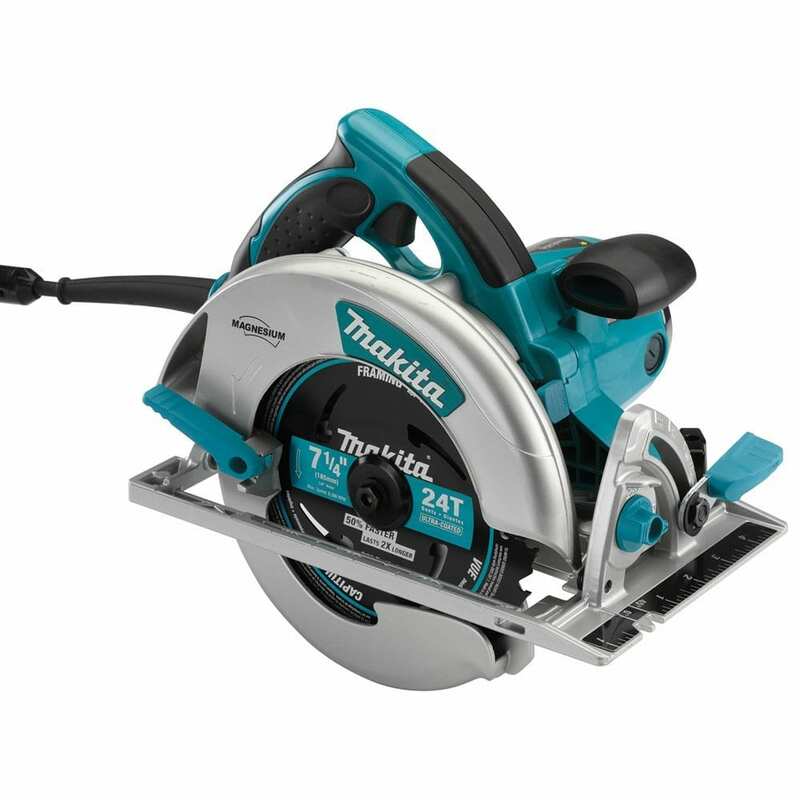 The Makita 5007MGA Magnesium circular saw is a personal preference because I am convinced that it is designed with power, performance and comfort in mind. I also love other features that it is equipped with, such as the electric brake which provides protection to the users. I have decided to create this review to help you make a good purchasing choice as well. There is nothing more satisfying than seeing the output of my own hard work in completing DIY projects at home. Rather than trusting the task to a professional and pay a huge amount of money, doing it by myself, with the help of power tools, is more worthwhile because it helps me to learn even more. This has led me to searching for the best power tools that can help me accomplish my tasks. Specifically, I was searching for a power circular saw that is designed to help even non-experts like me with my projects. I have come across the Makita 5007MGA model, and honestly, I was expecting a lot out of its features. I hope I had already known about it when I was searching for tools the first time. It could have saved me a lot of hassle from the start. I am interested in knowing what capabilities this tool can bring into the table. The Makita 5007MGA circular saw is obviously designed, not just for experts in the wood working industry, but also to beginners and learners as well. This is evident with the installation of an electric brake which implements better control while using the tool. Another concern that I always have when it comes to selecting a tool is portability. I have come across seemingly powerful options, but they are a failure when it comes to being portable. With the use of a convenient circular saw which offers portability alongside several other features, I believe that I can explore further and improve in this hobby. Who knows where this will take me in the end? Most experts I have talked with recommend looking for a circular saw which can accept 7 ¼ blades. After all, they are among the most common ones, allowing you to find a good option easily. It is also recommended looking for a circular saw that comes with a longer cord. This is a good reminder because some models sport really short cords. While there is an option to use an extension cord, it might cause certain inconvenience later on. Looking for an adjustable base plate can also offer several benefits. This feature can help you in making those precise angle cuts. They can also come in really handy with your tasks. Not all models come with electric brakes. This feature works in stopping the motor of the saw in approximately two seconds right after the trigger is released. A saw that does not have an electric brake often takes about 15 seconds to do so. This brake reverses the electricity flow in the motor. This is beneficial as it provides protection and safety to your fingers and limbs. As the blade is stopped quicker, you can have less chances of being hurt. A saw should come with shaft locks. This often comes in the form of a button that can be pressed, holding the blade still. This feature makes the changing of the blades easier. A professional grade circular saw typically has this feature, while some cheaper models may not have it. Different circular saws cater to different sizes of blades. If you choose a model that is corded, a 7 ¼ inch tool is a good option. On the other hand, a 6 ½ inch blade capacity is good for a cordless model. While the bigger blade options are obviously heavier, they can result to less cuts, particularly when working on angle cuts. The Makita 5007MGA is a good option overall because of its standout design, cutting capabilities and raw power. Because of its lightweight and balanced overall design, this model of circular saw is highly maneuverable at the same time. It also uses a high-powered, fast blade which is designed to effortlessly rip through wood cleanly. It is also a corded saw, with features that make it convenient to use. For instance, it uses positive bevel stops which helps in quickly creating bevel angles. The sheer power and overall design elements of this model make it one of the best options out there. This circular saw comes with a weight of 10.6 pounds. Despite the fact that it may not qualify as the lightest option out there, it is light enough to be controllable and maneuverable when making cuts. It also offers a design that is well-balanced, as it feels very comfortable to handle and hold. The blade is situated strategically on the tool’s right side, meaning you can see the blade completely while working. A spindle lock is a feature that adds to the convenience of this model. It enables you to press a certain button, locking the spindle right in place. With this, you can easily use a hex key in order to take the blade off. This can prove to be very convenient on your part, since you no longer need to use wrenches just to remove the saw blade. This model comes with a dust chute which guides extra dust far away from the blade. This is done in an effortless manner, preventing the saw from getting jammed up, ensuring the visibility of the blade. As you rip through a certain material, the chute works in blowing sawdust away from the cutting line, improving your capability to see the cut clearly. The Makita 5007MGA circular saw is equipped with raw speed and power. Its 15 amp motor power can produce a speed of up to 5,800 RPM, fast enough to smoothly cut through materials quickly and cleanly. This tool also operates in the standard 120 volt power, and can be run off using a generator for portability. As a bonus, this saw comes with a hard carrying case, which is very effective in providing protection to the tool, while making it very easy to transport at the same time. For added capability, this tool is also equipped with a rip fence which can be attached easily to the shoe, resulting to quick and consistent cuts. This circular saw model is equipped with raw power and speed enough to evenly cut through materials. Comes equipped with an attractive, professional design. Equipped with a dust chute which effortlessly guides dust away from the cutting blade. This model does not have a laser guide as one of its features. One customer was glad that he bought it. He said that it is quite a “pleasure to work with”. He likes the fact that this model can blow the dust off the cutting line. Another customer is a tradesman, using this saw each and every day. He loves the built-in LED light since it does not just work in illuminating the cutting line, but it also allows you to know that the saw has power to operate. One customer suggested the possibility of improving the case. This is because it is quite challenging to learn how to coil the cord properly in a small coil in order to tuck it right next to the saw and close the case accordingly. The DEWALT DWE575SB model is quite an impressive option that features an outstanding design and excellent handling. With a weight of 8.8 pounds, it is easily the lightest model in this list. As such, it is very easy to maneuver and handle while cutting through different types of material. As a sidewinder circular saw model, the blade is located on the right side, sacrificing visibility of a blade for a balanced and comfortable design. Bosch CS5 is known for its dependable overall performance. It stands out from the others because of its professional grade, high-end design, power and quality. With a maximum speed of 6,200 RPM at 15 amps of power, it is the fastest in this list. Since the blades are located on the left side of the tool, you can enjoy an unobstructed and clear view of whatever you are working on. Because of this visibility level, it no longer comes with a laser guide. The Craftsman Evolv circular saw offers a speed of 5,500 RPM raw energy, efficiently cutting through materials such as concrete and wet lumber. It is equipped with lower blade guards as well as die-cast upper which are constructed of lightweight aluminum. This reduces the overall weight of the saw, turning it into a very portable and handy equipment. It is designed for jobs involving rugged cutting such as continuous wood cutting and masonry. It is also equipped with a highly ergonomic glove grip bail and D-grip handles, ensuring maximum control and comfort. The SKIL 5780-01 circular saw is backed up with the reputation of its manufacturer, having been known in this industry since the early 1920’s. This particular model combines together efficiency in design, power, as well as an overall positive handling experience, offering you a power tool that can be added to your arsenal. This saw has the capacity to handle amazingly, which means that each cut is smooth and effortless. The Black & Decker CS1015 model comes with a lightweight design, allowing you to create versatility in cuts. It is also a sidewinder saw, which means that instead of focusing on blade visibility, it gives better attention to having a well-balanced design. It is designed to create hassle-free cuts even on smaller materials. While it may not have positive bevel stops as well as a spindle lock, it is powerful enough to adequately perform. No doubt that a circular saw is an extremely useful tool for any wood worker, whether professional or beginners. The Makita 5007MGA model, in particular, comes with an electric brake, thus providing better protection to the user. It is an extremely promising option, thanks to the features that it is equipped with. For example, it has a convenient design that makes it easy to work on. It even has a built-in spindle lock which allows you to remove and replace the saw blade quite efficiently. As a product under the Makita brand, and a very attractive price point, this is a great option to take into consideration.